The captivity industry has dubbed June as National Zoo and Aquarium Month. Zoos can be miserable places for animals to spend their lives... but you have the power to help. Through our Zoo Check campaign, you can print out our Zoo Check Form - PDF, visit your local zoo, record your observations of the caged animals' living conditions, and return the completed form to us. The more information we compile, the more ammunition we have to pursue sensible and humane zoo reform. Please become a Zoo Checker this summer, and be the voice that these captive animals so desperately need. Downloadable Zoo Check Form - PDF. A tiger paces back and forth along the fenceline of his small enclosure. A giraffe, who instinctually seeks a wealth of trees to graze on, has picked her one tree clean. A lonely elephant, isolated from companions for years on end, suffers from boredom and sways to and fro, standing in her own feces. The captivity industry has dubbed June as National Zoo and Aquarium Month: a self-congratulatory month-long promotion that encourages the keeping of wild animals in captivity. The cramped quarters of captive zoo animals provide visitors with seconds of entertainment, but at what cost? The animals endure a lifetime of unnatural living. Zoos neither educate nor conserve wildlife where they belong: in the wild. Zoos can be miserable places for animals to spend their lives... but you have the power to help. Through our Zoo Check campaign, you can print out our Zoo Check form, visit your local zoo, record your observations of the caged animals' living conditions, and return the completed form to us. 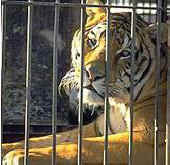 The more information we compile, the more ammunition we have to pursue sensible and humane zoo reform.